Posted in: BSU Journal Club. Tagged: astronomy, exoplanets, K2 mission. 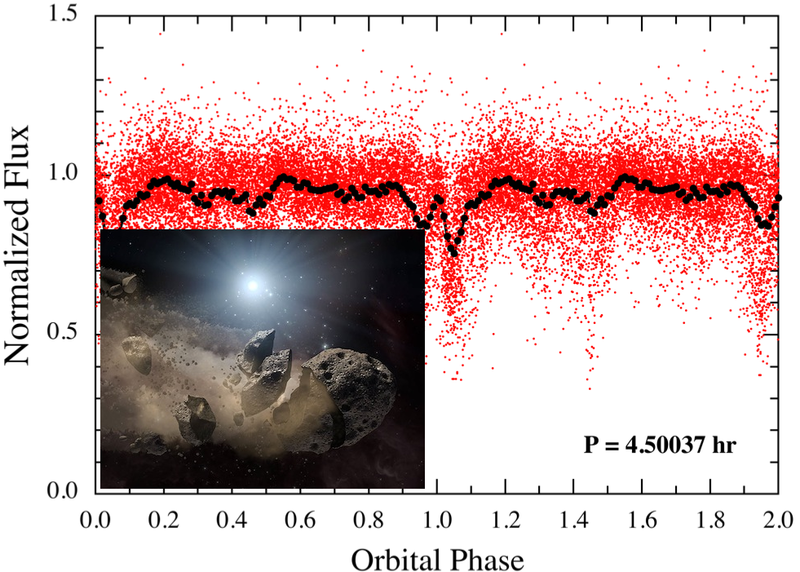 The red dots show the observations from this study, with the dips due to asteroid chunks transiting the white dwarf. The inset shows an artist’s conception of the disruption process. For our second journal club meeting this semester (didn’t manage to blog the first one), we discussed a study from Saul Rappaport and colleagues on observations of the white dwarf WD 1145+017, which continues to show evidence that it is eating a small asteroid. A study last year from Vanderburg and colleagues (which we discussed last semester) presented observations from the K2 Mission showing distinctive but highly-variable transit signals coming from WD 1145+017. That group conducted follow-up observations that pointed to the presence of an asteroid very close to the star, being ripped apart by the star’s gravity. As crazy as it sounds, the idea that some white dwarfs are eating asteroids is fairly well-established, but Vanderburg’s study was the first to present observations of the process clearly in action. The variability of the transit signals indicates that the violent process is dynamic and complicated. This new study from Rappaport and colleagues continues the saga of WD 1145+017 and finds that the disruption process persists more than a year after the initial observations. And using the apparent drift rates of the different chunks of asteroid, Rappaport is able to constrain the mass of the parent asteroid to be about 1% that of Ceres in our solar system. One of the most exciting aspects of this study for me is that the observations were made using a network of small, amateur telescopes. Some of the scopes used in the study were 25-cm, and so I’m hopeful that, in the near future, we will be able to use Boise State’s own Challis Observatory to conduct follow-up. Just gotta wait for a clear night.